A picture really is worth a thousand words, especially when you're trying to get information or knowledge to go from your head into someone else's. You can talk all day, but that sketch on the back of the napkin can suddenly make it all clear. When you're communicating, you have a thought bubble over your head with a representation of what you're trying to convey, and the listener/receiver has a thought bubble over his head with a representation of what he thinks about what you're saying. The big question is, do they match? If you use only words, there's a way better chance that the picture over the listener's head won't match. And sometimes even the subtlest difference is a deal-killer. But it's not just accuracy you get from using pictures... you get speed. 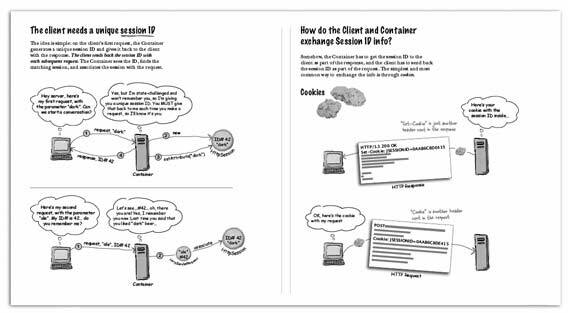 This picture from our servlets book, for example, did in a two-page spread what would have taken me many pages and several thousand words to explain with the same depth of understanding. And here's a third benefit: the brain likes them, so you have a better chance of getting past the brain's crap filter using pictures than words alone. For learning, there's a ton of research that supports using visuals. In one set of ten studies, people who learned from graphics and words together produced between 55 percent to 121 percent more correct solutions to transfer problems than people who learned from words alone (Ruth Clark and Richard Mayer). And I've talked before about how the effectiveness of words goes down as your audience gets younger, and/or has a brain raised in an increasingly visually rich environment. Remember, while those over 45 will generally say that pictures are used simply to support a text (but the text is primary), most twenty-somethings say that they'd be just as happy (or happier) if the text were there only when required to support the pictures. The pictures rule. I agree a 100%. Some blog postings ago, I can't remember which post it was, I mentioned the fact elaborate documents (i.e. with well chosen pictures) that I like to write still needed to be 'digested' by the evaluating guys here at work. ...Well they like them more now :-), and the initial investment in making them visually appealing, proves it's value especially when the heat is on, and the grey cells are tuned to speed instead of processing masses of text. Additionally it gives great satisfaction when these documents are suited both for internal communication as well as for our customers. Visual representation/interpretation is less constrained than it's verbal counterpart. I wonder if you can take it a small step further & say that incorporation of video can often help clarify difficult concepts at a level *beyond* static pictures. This would have been especially true for me in physics & math. I love the head-first books (and this blog). Working in an academic environment has had its challenges for those of us into the betterment of 'systems' - committees, how to enter marks into the student database etc. We are still currently in the over 45 environment, where the flowcharts (or whatever visual we are using) are supplementary to the primary text to the extent that the text is the 'paper' and the visuals are the appendicies. It had never occurred to me before that this was largely an age thing. It is also somewhat of an academia thing, but age plays a great part. We are trying to move to an environment where the flowcharts and the paper and the explanatory text (which I think will be needed for quite a while yet in our slow moving sphere)is the appendix. I'm still in the land of people wanting me to order the pages with the text first, but I think with a little patience and learning how best to diagram for best understanding, we will get there. I wanted to say that this blog has revitalised my work ethic. Despite working in different sectors, you guys think like I do - it is great. Keep up the good work. Visuals are also useful when you want to scan things for something interesting. Majority of your posts begin with cartoon and it lets me know in 3 seconds what the post is about and whether I want to read it right away or not. This is the reason I try to begin my post on my blog [ http://jdk.phpkid.org ] with a picture whenever I can! Using images is a great way to enhance communications but, my biggest problem with images is; where to find the ones I want? Could you do an article on where to get some good images to work with? Google is sort-of-helpful but most of results are not very good quality or the images I am looking for. Something that isn't adequately touched on here is that there could be more than one reason that visuals are becoming more popular. I suspect one reason is that many people cannot read and write as well as they should. I doubt that schools are adequately teaching logic and essay writing (let alone spelling and grammar). They probably haven't for several decades. My boyfriend's little brother is a good example of this. Currently his essays are terrible -- a mishmash of confused thoughts over far too wide a scope, whose logic is unclear. I'm coaching him on how to write essays, and his teacher says that he's improved markedly after a single evening teaching him about focus and structure. He's had 4 years of highschool English, and grade school English before that, and nobody has taught the kid how to write an essay or the fundamentals of logic required to do so successfully. He's applying for university and he can't express himself clearly and effectively in writing. That's all too common. Words and pictures each have their own strengths. While I don't want the return of books without pictures, neither do I want books where the text is reduced to captioning the pictures. How about having words and pictures working in equal partnership, folks? I agree 100%, but I've always been visually oriented! From a competitive analysis or positioning point of view, a picture is definitely worth 1000 words - and sometimes more! 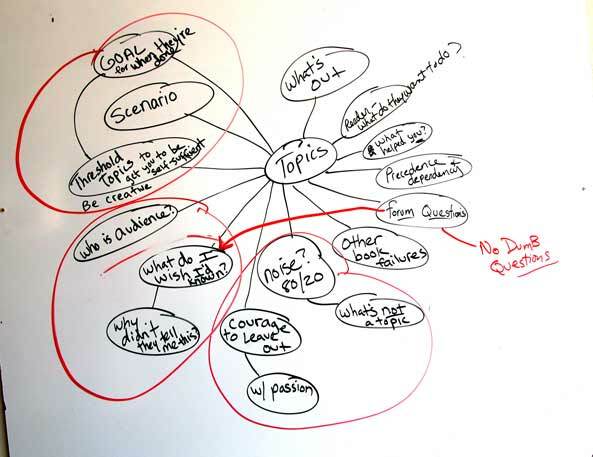 I have been using mind maps for about 15 years for all sorts of things like preparing for presentations, writing technical documents, filtering information, brainstorming and more recently as a means of presenting my resume. Last week I introduced my eldest daughter, Grace, who is 11 years old to mind maps and she used it to put together a 5 minute talk about herself. She has printed out the mind map and will present it to the teacher as part of her assignment. Grace mastered the concepts in minutes and could organize her random thoughts into a cohesive piece using something like MindMapper. One day I will put together a technical book, which consists solely of mind maps on the subject. How do you compare the information resolution of a mind map with other visual techniques? Just an observation: Most (all?) graphics I saw in this book have words in them. Maybe the a picture is worth more than thousand words, but what would these pictures be worth without the words? P.S. : A word can be worth a thousand pictures - just listen to a good storyteller!